Don't forget to restart PSP after installing a new plugin! Open a new image 400 x 400 pixels, transparant. From now on I name this one as work image. Open pic1 from the zip file. Copy pic1 (right mouse button) and paste into selection in your work image. You may close pic1 now. Open pic2 from the zip file. 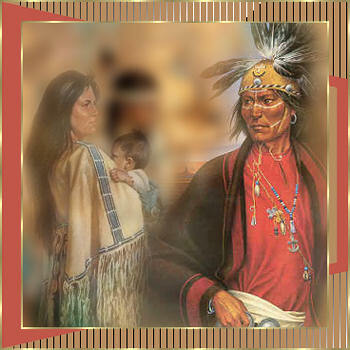 Draw a selection around the woman with the child. With every left mouse click you fix the selection. Hit delete on your keyboard to go back a step. Click with your right mouse button when you are all around the woman and child. You will see a wider selection than you've made, that's normal. Click on the little hand in the toolbar. Click right in the selection and choose copy. 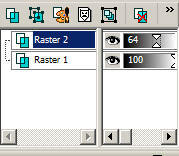 Back to the work image, click right and choose Paste as new layer. Move the lady to the left corner with the move tool. Open pic3 and do the same as you did with pic 2. Move the man to the right and change the transparancy from 100 to 80. Of course you can chance this tranparancy if you don't like it this way. Image - add borders - 2 pixels symmetric. Make sure you use a color that's absolutely not in the picture. Select the border with your magic want tool. Your feather will probably be on 25, so you have to change it to 0. Flood fill de border with a gold pattern. Select the border and flood fill it with this color. Add another border of 2 pixels, select it and flood fill with the gold pattern. Select the two big light brown areas in the 20 pixels border. By pressing the shift button, you can select them both.